You’ve probably heard the term “fiber” thrown around when reading or talking about your internet connection. If learning about “all things internet” isn’t really your cup of tea, the word fiber might only remind you of Cheerios or Raisin Bran. Fortunately for you, we aren’t talking about breakfast cereals. In the world of telecommunications, fiber refers to a “fiber optic” line that’s used to transmit data in the form of light from point A to point B. In the case of fiber optic communications, point A simply means an origin source (or node) and point B means your home. 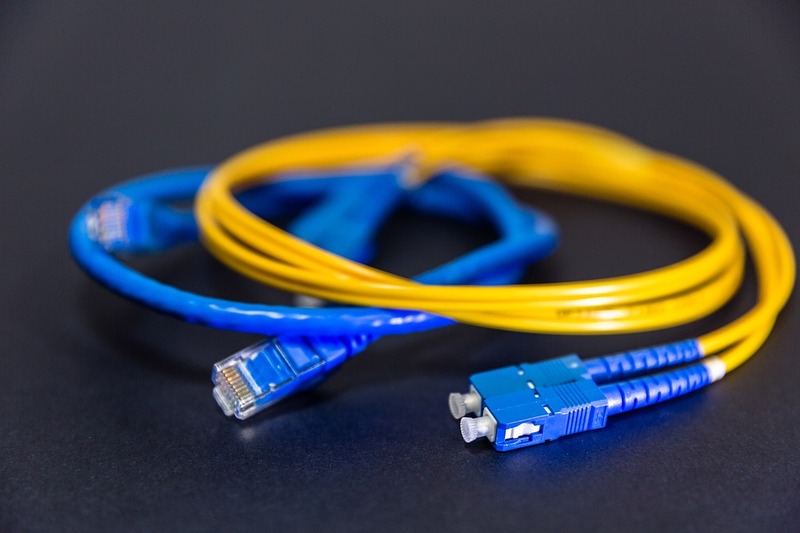 Two main types of fiber optic cables exist to bring a connection to a home: Single Mode Cables and Multimode Cables. Now, the process of how a single mode cable vs. a multimode cable works can get a little complicated, so we’ve only included the most important concepts here. A single mode cable is a single strand of glass fiber. It uses two different frequencies to send and receive data (aka upload and download) along the same cable. This way, your data remains “clean” coming into and leaving your home. Single mode fibers carry high levels of bandwidth across extremely long distances. Multimode cables are also made of glass fibers, or in some cases plastic, and transmit data at high speeds over medium distances. Multimode cables are paired together, using one cable to send data and the other cable to receive data. The downside to this type of cable is that it loses the ability to transmit high bandwidth levels over longer distances due to the light wave distortion. What does fiber mean for you? So, you might be thinking, “Well, that’s nifty… but what does all that actually mean for me?” Good question. The development of fiber made a pretty big splash in the world of telecommunications. The installation of a fiber cable allows a company to do three main things. One: replace older and slower copper cables; two: expand services to previously unreachable areas; and three: give customers significantly faster connection speeds. Prior to the development of fiber in the 1970s, companies used copper wire to transmit electrical signals from home to home or from a home to a central office (CO). 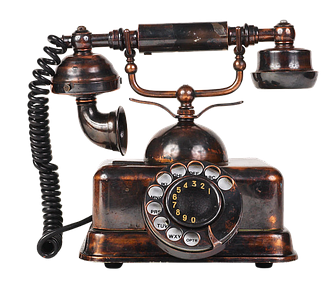 Phone systems, meaning a typical home phone, sent voice signals along the copper wire. The wire did a great job of transmitting those small, uncomplicated signals relatively quickly. When the internet and cable TV came booming in during the late 80s and 90s, copper wire struggled to keep up with the amount of data needing to be sent along the wire to create a crisp, clean connection. In comes fiber. Fiber uses light waves to transmit data, meaning that data could now potentially travel at the speed of light (even though it doesn’t, as our current technology can’t handle that type of speed). Now, people can upload and download videos, photos, songs, etc. in HD, ultra HD, or 4K on multiple devices in one home using fiber. Pretty cool, huh? The tech world considers fiber optic connection to be the future of broadband connection. Installing a fiber optic line to your home means that you get direct access to a “lightning fast” connection. 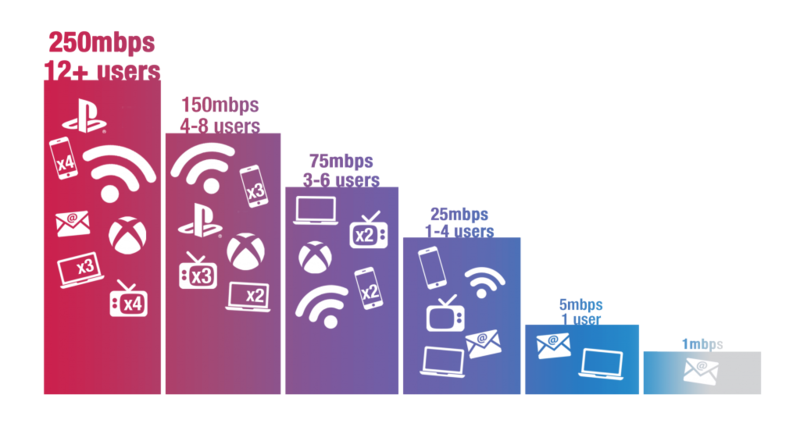 Depending on the bandwidth speed package you’ve chosen, a fiber connection allows anywhere from 3 to 20 users to “sit” on the same WiFi and use their smartphones, tablets, TVs, etc. and not experience buffering or lost connection. Not sure what speed you need? This handy chart can help you determine your speed needs based on how many users your connection should support. For example, Let’s say you live in a household with four people. Each member in the house has smartphones, there is a computer or laptop, and you have a subscription to an “over the top” service like Netflix or Hulu. You’d need at least a 25mbps internet speed package. Simple, right? Here at MTC Communications, we believe that any interaction with the internet, TV, or streaming services require a minimum 25mbps connection to truly be successful. This is why 25mbps is the lowest package available to our customers. Not sure what your current connection speed is? You can check your speed with a free speed test using a Google search here.